American colleges and universities have gloomed onto the money machine called "licensing" and are circling their wagons to defend their treasured logos and mascots. We do not have a problem with this in general. It is when these institutions of higher learning do not take the time to learn the law and place themselves higher than the rights of individuals. 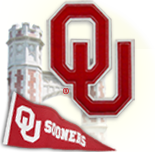 We inaugurate this page with the twin yo-yo universities in the great state of Oklahoma: Oklahoma University and Oklahoma State University, compliments of their respective yo-yo representatives, Suzanne Staley, and sidekick Judy Barnard. The Scene: the weekend of October 26 - 28, 2007. After donning their vigilante costumes, Suzanne Staley, and sidekick Judy Barnard, descended upon the Affair of the Heart craft show in Oklahoma City and began breaking the law by confiscating what they felt were infringing craft items for sale. You see, they felt empowered by Oklahoma Law which says articles bearing counterfeit trademarks may be seized, and possibly the subject of forfeiture at a later date. Their problem was that the statutes did not say that the owner of the trademarks had the authority to personally seize the alleged infringing items whenever they so chose. But did that deter the Avenging Angels? Of course not! They had the law on their side. Ride 'em cowgirls. Dig them spurs in. They donned their gun belts, strapped down their holsters, and did their Christmas shopping a bit early, taking whatever they wanted that, to them, was the rightful territory of the Universities. Those trespassers would soon feel the sting of frontier justice. Or, frontier injustice as later determined by the District Attorney. "Connie Harris, one of the craft show's founders, said many vendors are upset by the situation and had to close down their booths. 'My husband was mentioning a lot of the things were merchandise that they bought that was licensed and altered -- like Hancock's carries OU and OSU licensed fabric. They just bought that and made a pillow. That's legal, and they confiscated stuff like that,' Harris said. " However, the flopsy twins didn't bother to read the important part of the statute, which begins with: "The investigating law enforcement officer may seize any item that bears a counterfeit mark..." (emphasis added). They made themselves the investigators, the seizing authority, judge and jury. It appears they "knew" what they were doing was illegal because the vendors were given a voluntary surrender of property form and many were "coerced" into signing it. One vendor who refused to sign the form had it filled in and her name signed by the vigilantes. Is this what they teach at Oklahoma Colleges? Trample on the rights of people doing nothing wrong? Just take what you feel is rightfully yours? What about "due process"? Or is that only for others? Two weeks after the Roundup At Affair of the Heart, Oklahoma City prosecutors were debating whether or not to file larceny charges against Suzanne Staley, and sidekick Judy Barnard. Another article, the same day gives the distinct impression the vendors were wrong, not the schools. It appears reporter Sara Ganus got all of her information for her articles from the schools and not from trademark law, and she got it very wrong. "Vendors lost anywhere from $150 to $7,000 worth of merchandise, and many said they were "repeatedly threatened," if they did not hand it over, according to police reports." Does either or both of the universities have law schools, or at least lawyers on retainer, that could have been consulted before the ill-planned raid began? Or do these two women know all? One would think that these "Death Wish" vigilantes would consult some legal source before formulating their attack plans or were they just determine to punish anyone who might wander into their paths? Someone should tell them that "OK" does not apply to their mutual stupidity. As of February 2008, the dispute had been resolved but the papers do not give much information. It's likely, despite their press releases, that the Universities backed off to get the charges dropped. The Universities publicly keep pushing their "licensing" programs but as noted, many of the vendors were mugged by Suzanne Staley, and sidekick Judy Barnard, even though they weren't selling infringing crafts. Oklahoma University and Oklahoma State University, along with their over-reaching and fellow Hall Of Shame buddies, the Collegiate Licensing Company, are illegally interfering with legitimate sales of non-infringing merchandise. We call their tactics "extortion". The Daily Oklahoman, printed a puff piece on November 17, 2007, that sounded like it was dictated by the universities. The piece also failed to state that the Louisiana Federal Court District decision they quote was still pending in the Court of Appeals for the Fifth District. Convenient omission. The Court of Appeals upheld the decision November 25, 2008, a year later. But the issues were not the same so the allusion to the court case was deliberately misleading. But then, lawyers are paid to lie to you. The piece also claims the CLC seizes merchandise, a claim we have not found credible nor have we been able to verify so we doubt it is valid. The Tulsa World did a follow-up piece February 8, 2008. Along a similar line, a woman who was arrested in Denver October 27, 2007, while selling t-shirts outside Coors Field during the World Series has received a financial settlement from both the Colorado Rockies and Major League Baseball for having her arrested for alleged copyright and trademark infringement. The City of Denver is settling her false arrest case for $20,000. The Denver police officer arrested Christina Eyre at the direction of a representative of Major League Baseball when she refused to stop selling t-shirts she had hand crafted. Major League Baseball is also paying her to drop her lawsuit. On these pages because they seem to think they own all references to the word "Longhorns" and to any graphic representation of a longhorn's head.